New Samyang Lenses. Cine versions of the 7.5mm, 10mm, and 12mm, plus a new 300mm f/6.3 mirror lens. Article on sansmirror.com. Data page for 300mm. New B&H mirrorless camera deals (advertiser link). Panasonic released their fiscal year results: camera sales down 25% year-to-year (to 69.5b yen, implying something around the 2m unit total for all compact and mirrorless cameras). Leica Announces Real Mini-M, the T. Today Leica introduced the T type 701, which is decidedly like a Mini M with a modern interface. Article on sansmirror.com. Camera data page. T-Lenses data page. Nikon V3 First Impressions. I can sum up everything about my first day of shooting with the V3 in four words: what were they thinking. Article on sansmirror.com. Fujifilm 10-24mm First Impressions. I was startled by how big the retail box was. Huge. Just how big was the wide angle zoom lens that was inside? Article on sansmirror.com. In addition, the entire Articles section on sansmirror is being revisited and the various different guides and systems information in those articles updated. This begins a process of my working through the entire site and making sure everything is up to date. I’ll be making some small UI changes as I go to better support mobile devices, in particular Safari on iOS. Remember, though, that you can always tap on any item in a menu, even sub-menu names, to see the site from that point. When menus scroll off your screen, this is the best strategy on small devices: tap on the main menu to see the sub-menus in it, tap on a sub-menu to see the pages in it, tap on the page you want. Lytro Goes Pro. Lytro pre-announced the Illum, a new light-field camera that will ship this summer. Article on gearophile.com. New Nikon Repair Experiences have been posted. Camera Raw 8.4 Fix for Mac users. Strange Image Sizes. For some reason I got multiple “strange image size” emails while I was out of the country. I hope this isn’t someone pranking me, but I’ll deal with it in this article. Article on dslrbodies.com. Nikon Focus Followup. Yesterday I wrote that the real issue that needs addressing in cameras is focus. Here are some specifics on where I believe Nikon is missing the boat with focus on DSLRs. Article on dslrbodies.com. It’s the Focus Nikon Should Focus On. When you’re offline for a couple of weeks as I’ve been, you get the chance to process information without the constant ping of new data points arriving at your senses. Here’s what struck me after being Internet free while shooting for two weeks. Article on dslrbodies.com. Nikon Software Updates. Capture NX2 and ViewNX2 were updated, but not Capture NX-D ;~) Article on dslrbodies.com. The DX Zooms Keep Coming. Nikon has announced a new version of the 18-300mm DX lens. Article on dslrbodies.com. Data page for lens. Nikon J4 Announced (But Not for US). Nikon announced the latest update to their basic mirrorless camera. Article on sansmirror.com. Data page for camera. Adobe Updates Include Lightroom Mobile. Adobe announced a new member of the Creative Cloud bundle. Article on dslrbodies.com. Sony A7s Surprise at NAB. 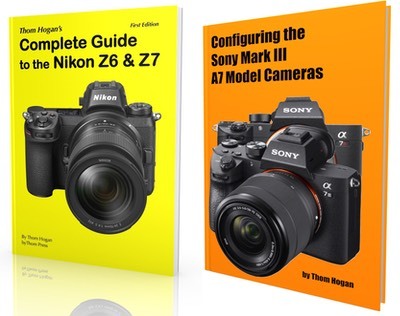 Sony adds a third A7 to their lineup. Article on sansmirror.com. Data page for camera.